The Amelia Douglas Gallery’s new exhibit brings together unique glass sculptures with rich histories and colourful, evocative abstract paintings overlaid with text. 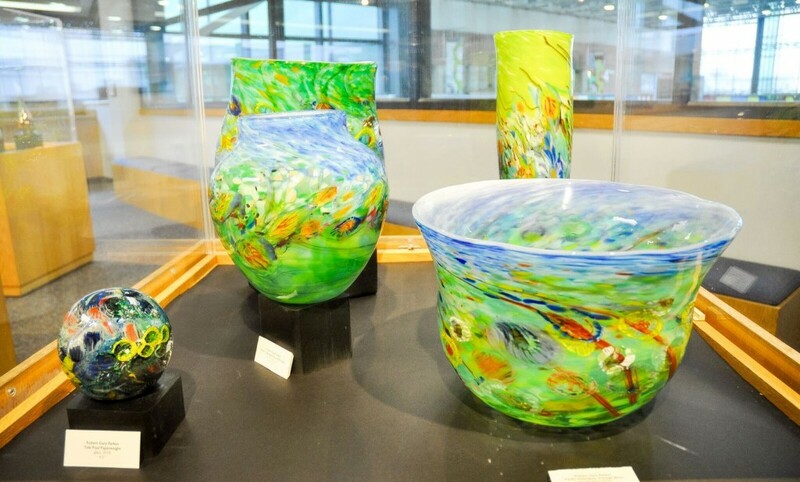 Titled The Pacific and Other Stories, the exhibit opened on April 26 and features the artwork of realistic and abstract artist Denise Dupre, based in Port Moody, and glassblower Robert Gary Parkes, who runs a studio in Surrey. The two artists were selected by the gallery to create the exhibit together, with their works complementing one another in colour, theme, and narrative potential. Dupre’s abstract acrylics on canvas are composed of bold areas of colour, predominantly sweeping marine hues and sepia tones across busy compositions full of textures and spaces. Each painting also contains words and letters strikingly arranged in elegant typefaces. Along the wall of the Laura C. Muir Theatre hang three larger 36” by 60” canvases with vast, mesmerizing expanses of oceanic blues and greens. The artist told the Other Press at the show’s opening reception that she considers all of her works in this exhibit to form a complete body of work, but that they also all stand individually, with each combination of text and imagery telling its own unique story. “There are a couple that relate to the West Coast, our Pacific Waters, but the others really are narratives in their own right,” she said. Dupre does not only do abstract art: She began in the style of realism, and still returns frequently to realistic painting between creating series of abstract works. While her realistic works are often planned out in advance, based directly on photoshoots she does of the West Coast and its surrounding life, her abstract pieces develop far more fluidly and organically. Parkes’ glass-blown pieces are also full of individual stories. His masterfully-crafted vases and pots, with their dazzlingly intricate swirls, spots, and other vivid textures beneath the smooth glass surfaces, are the result of a lifetime of practicing, making mistakes, and learning from others and from the glass itself, he told the Other Press. The pieces in this show, and many of Parkes’ other works, are made partly from scraps and broken pieces of glass from previous creations out of his studio. For example, he said, when he trims the lip of a vase, he will take that little piece of cut-off glass and reuse it for the ornamentation on a new piece. This repurposing is both economically practical and serves to enrich the artwork’s ornamentation, he said. Parkes also emphasized the centrality of glass in our everyday lives and throughout history, although this importance often goes unacknowledged. Glass was essential for building cities in creating windows, tools, and other utilitarian items. Today, it’s everywhere—in our homes, in our phones, and in so many other things we largely take for granted. In fact, if you go down deeply enough, Parkes explained, it’s at the heart of the Earth itself. The Pacific and Other Stories will be open in the Amelia Douglas Gallery, on the fourth floor of the New Westminster campus, until June 23.